In advance, things didn’t look particularly promising. The weather forecast was for rain and the Edgbaston drainage system is notably poor – we understand that the design was actually to be used in the Gobi desert but there was a mix-up in the engineer’s studio. The day coincided with the start of football’s Premier League. David Lloyd had to have knee surgery. This could have been the recipe for an underwhelming, damp squib Finals Day affair. But holy cow it was a fantastic day of entertainment. Note that we said entertainment. 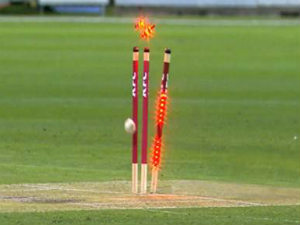 The whole premise of T20 cricket is that it should be fun – for players and for spectators alike. Generally 51allout are a pretty conservative bunch (unless it concerns flashing bails) and tut with disgust at loud music, crowd entertainment, drunks in fancy dress and David Lloyd acting the fool. However on a day like this, the more the merrier. There ought to have been acrobats on trampolines, a hogshead of real fire and Henry the horse dancing the waltz. Of course the cricket is the centrepiece of the day, but that too should be fun. And it was. Even Liam Plunkett enjoyed himself. The pitch was, in current parlance, a belter. The rain stayed away long enough to not do any real damage. Each of the three games were genuinely enjoyable; if the standard of bowling and fielding were at times slightly substandard, the quality of the hitting was immense. David Willey has become a cricketing sensation. The season’s surprise team have deservedly won their first silverware since the early 1990s. Surrey’s team of late thirtysomethings lost out. A few moans: we’d like to have seen Richard Levi fail miserably, because he really is the most one-dimensional fat man we’ve ever seen. Hampshire should have batted better; it would have been nice to see Michael Carberry or James Vince play another quality innings (and not solely out of support for that county, but as a counterpoint to the more sloggy kind of innings that characterised the day). And they really ought to have flashing bails. There’s no denying that it is a long day: up to 120 overs spread out over the course of around 11 hours. But the timing of the games allows those involved to have a breather – and presumably lets the crowd get even more tanked up. There were more than 900 runs scored in the day. There was crowd-player interaction. 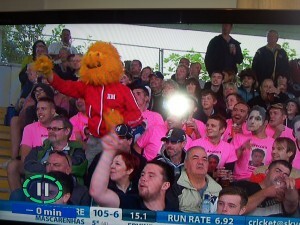 Even the appearance of Sky’s Darren Campbell in the Mascot Derby didn’t spoil the event. And the moment when Willey completed his hat-trick to win the match was one of the most satisfying and rewarding moments we’ve seen on a cricket pitch for some time. The peripherals – the banter, the fancy dress and the awful Sky segment involving Carberry giving Nick Knight tips on DJ-ing – were all temporarily forgotten. The day was ended by a fine young cricketer having his finest match and it meant that he, rather than Bumble or the Sussex mascot, topped the bill. David Willey – a bit like Sid the Shark. And Sussex actually won something for a change. Good old Sid The Shark in the mascot race!